This Mother's Day, give Yourself, Your Mom, Your Sister or Your Friend the best Gift in the World - The Gift of Self Care!! TRY A WELLNESS CLASS ON ME! FIRST CLASS FREE! EXPERIENCE WHAT ALL THE FUSS IS ABOUT WITHOUT COMMITTING! WHAT’S BETTER THAN THAT! 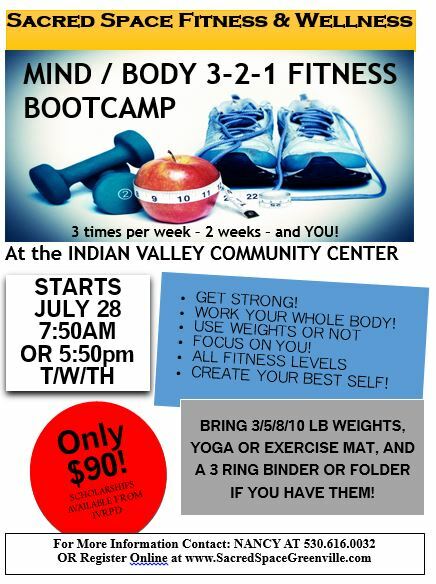 WELLNESS CLASSES NOW AT INDIAN VALLEY FITNESS! Unsure of how to reach your health and wellness goals? Schedule a Free Session with me to talk about how my 20 years of holistic health experience can help you attain the wellness lifestyle you want! When Scheduling Online, Enter the Coupon Code: NEWCHESTER to receive $10 off your first massage! 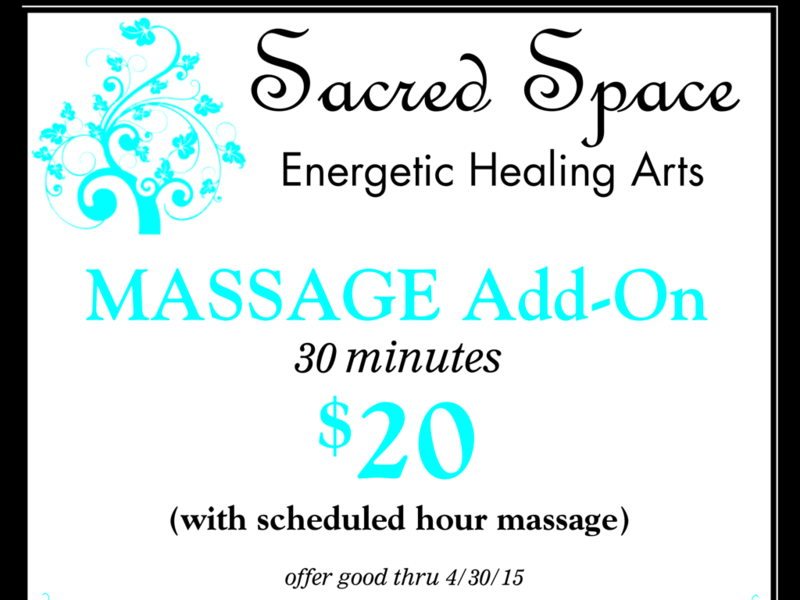 Only available for new Clients to Sacred Space Massage & Wellness! 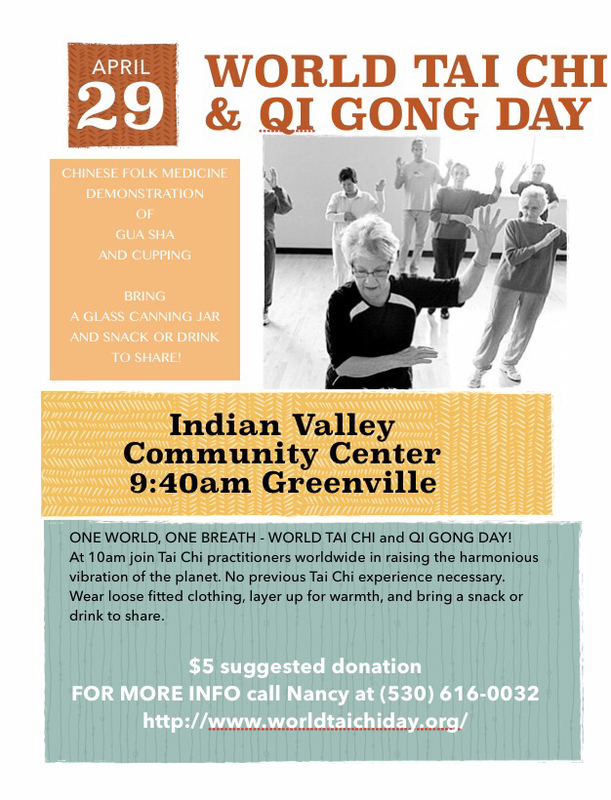 JOIN ME APRIL 29TH FOR WORLD TAI CHI & QI GONG DAY! WE WILL EXPLORE TAI CHI & CHINESE FOLK REMEDIES AFTER! 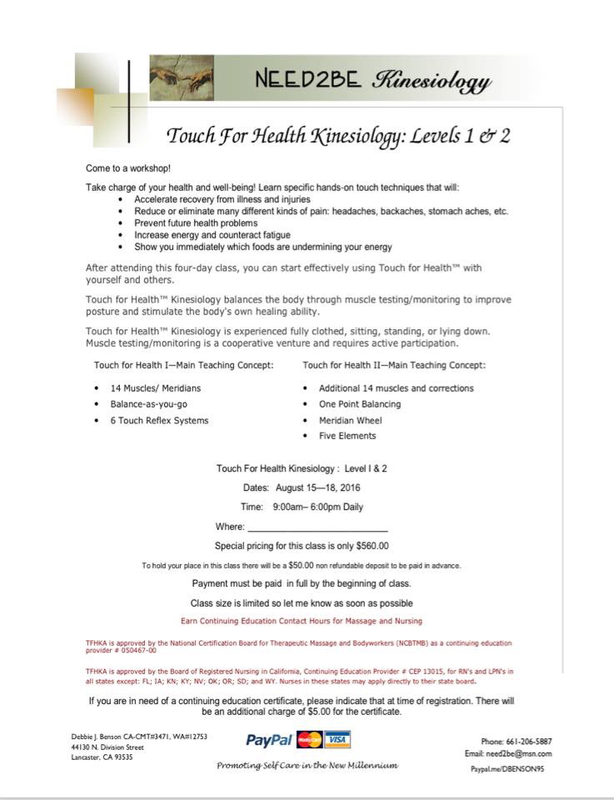 Touch for Health Kinesiology Training coming this August! 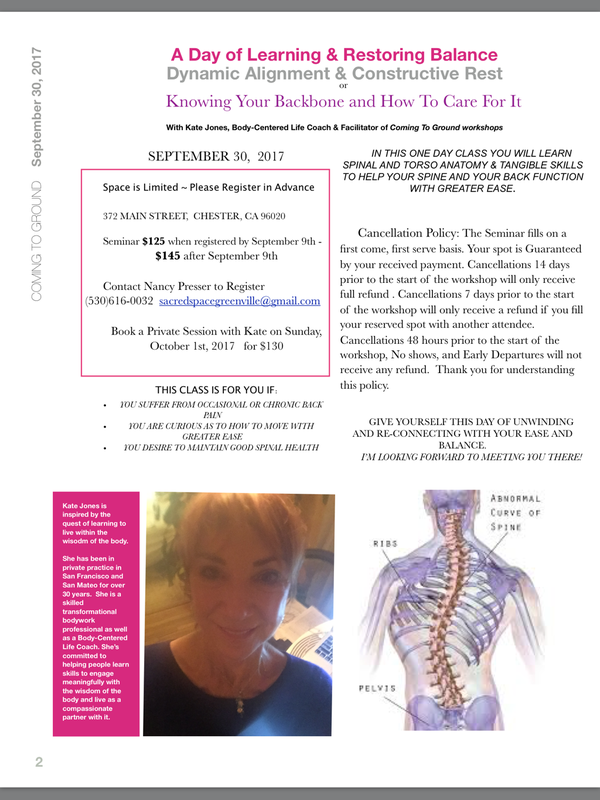 I am extremely excited to announce that Debbie Benson will be offering a Touch for Health Kinesiology Level 1 & 2 Class to all that are interested this August 15 - 18 at Sacred Space! This is a fabulous health care system that anyone can do for yourself and your family! Touch for Health combines Muscle Testing, Acupressure, Meridian Therapy & Energy Release. I know you will love it and find it enhances your health & wellness! This Video shows an example of how Touch for Health can help you improve your energy about a situation. Space is limited (as you know), so if you are interested in this training, send in your deposit as soon as possible. Click here for all the information you need. Keep an Eye Out for my NEW Program Coming Soon!!! I am currently working on developing ONLINE LIVE VIDEO CLASSES! If you have a topic you would like me to present, please message me with your ideas! Thanks! The AromaTouch Technique is an essential oil application to the back and feet. This 45 minute technique combines the unique benefits of human touch with the power of essential oils to create an overall wellness experience. Each essential oil in the AromaTouch Technique was selected for its individual aromatic properties, and for their aromatic properties when combined. The overall scent of the AromaTouch Technique is soothing, light, and pleasant to the senses. 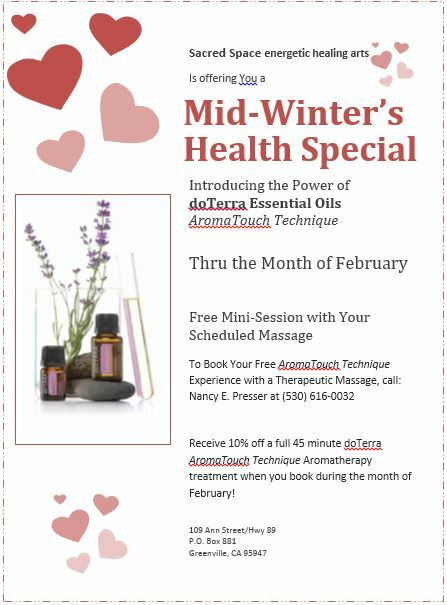 Book your experience of the AromaTouch Technique from now until February 29. Call me for more details: (530)616-0032. NEW CLASS FOR SUMMER - Start July 28th, 2015! Get that body moving in this mid summer fitness class. 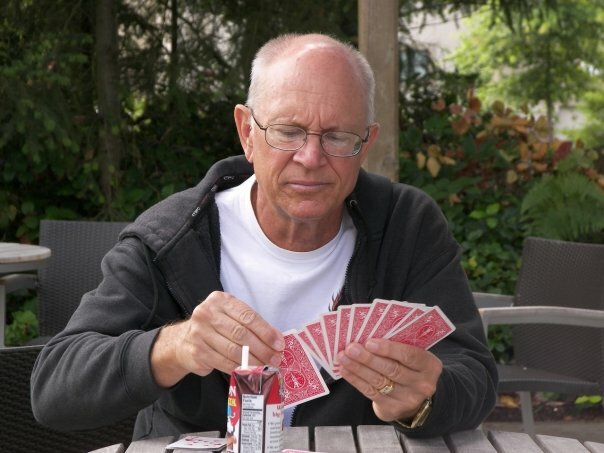 It is never too late to feel fit. 3-2-1 Fitness BootCamp is a 2 week intensive class that meets 3 times per week for 1 hour each meeting. It combines the best of mind/body affirmations with total body fitness. All fitness levels can join! It's not too late to get Dad the best Father's Day present ever! 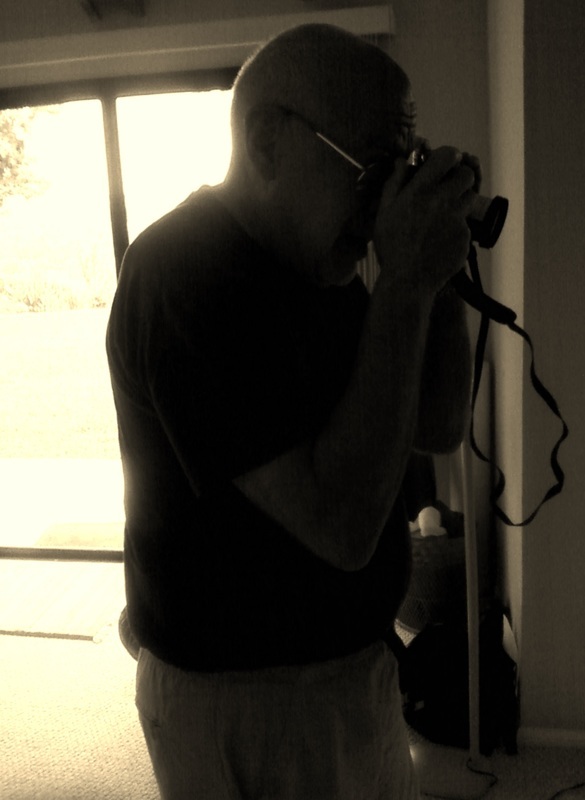 Come by Sacred Space energetic healing arts this week to pick up a Father's Day Gift Certificate for Dad. Giving your son, brother, husband, dad the Gift of Massage will be a gift that keeps on giving to him. Massage decreases his blood pressure, relaxes his over active mind, promotes better sleep, and of course helps reduce pain, swelling and inflammation in the muscles and body. Give me a call at 530-616-0032, before you come in and I will have your Gift Certificate waiting for you. Sacred Space, is open Tuesday through Friday 11am to 5pm. Mondays and Saturdays by appointment. Need a really unique gift? Consider gifting Dad a Gift Certificate to a Tai Chi exercise class. Tai Chi will help Dad get back into shape, improve balance, and promote memory. Cash, Check and Credit Cards accepted. Only a Fool would pass up this Promotion for the Whole Month of April. 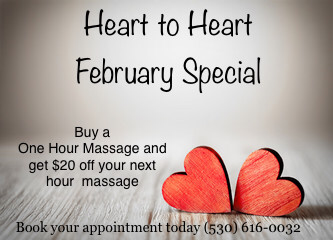 This Month only, you can Add-on an extra 30 minutes to your already scheduled 1-Hour Massage for only $20. That's a $10 savings to you for a 90-Minute Massage. 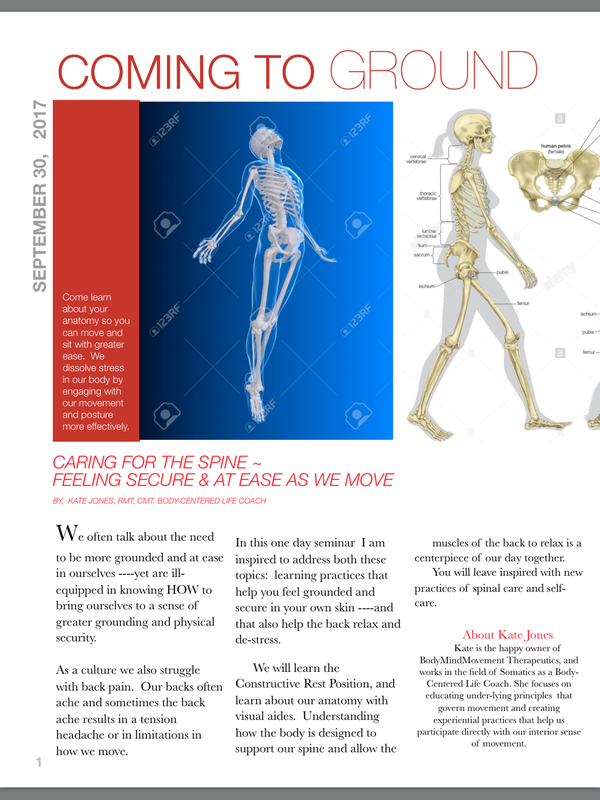 With Gardening Season here, your Low Back, Shoulders, and Knees will appreciate some additional time to work out the weeding kinks. Call or contact me to schedule your appointment today. 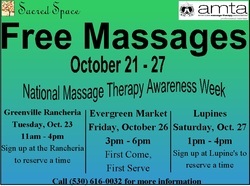 Join me Saturday, October 25 from 11am to 4pm for National Massage Therapy Awareness Week Free Massage Demonstrations. NMTAW gives you the opportunity to see, hear and feel how Massage Therapy can benefit you. It is your body you live in. You only have one. So take care of it the best way you can. Massage will do that for you. Come by and feel what your mind and your body will get out of a massage. June is Dad and Grad Month! Many Mom's were honored in May, now it is time to look ahead to June. Two major events happen in June; Graduations and Father's Day. Remember the special loved ones in your life by giving the gift of self care. Massage Therapy will take that stressful edge out of your hard working Dad or Grad. They will return to you all smiles and appreciation. Gift Certificates available for 30, 60, or 90 minute massage sessions. Cash, Check and Charge Cards accepted. Call 530.616.0032 for more details. Ready to jump start your New Year's Resolutions? Stop by Saturday, December 14 from 12pm to 5pm for FREE Demonstrations of the services that Sacred Space offers. Want to take back your health? Try a 20 minute Yoga or Tai Chi demonstration. Need Pain Relief? Try a 20 minute Massage Treatment. Your choice! 20 minutes FREE. 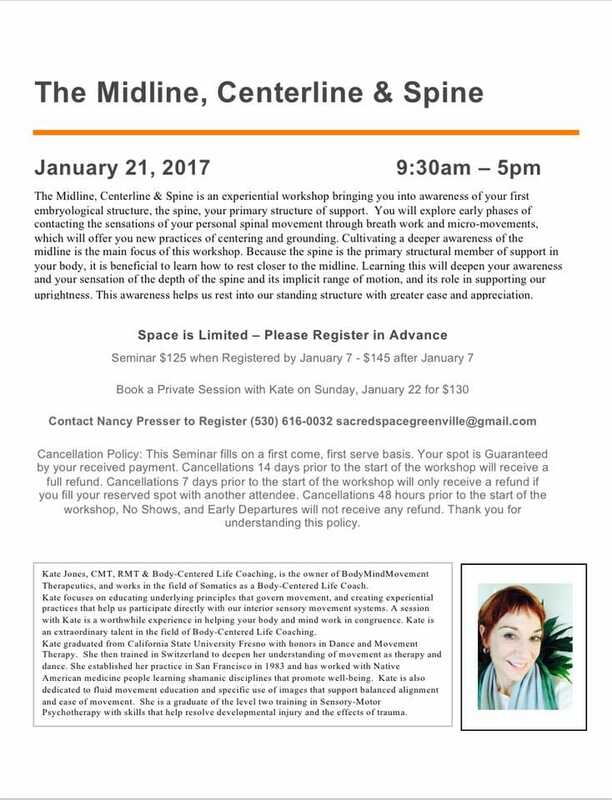 Make an appointment ahead of time or stop by at your leisure -- Demonstrations offered First Come, First Serve! After shopping Plumas County's Holiday Open House event come revive your body and spirit with a FREE 15 minute massage from 2pm to 5pm, Saturday, Novemeber 2. Massages offered on a first come - first serve basis. If you are the only one that shows up, you could receive a longer massage!!! Healthy snacks and drinks will be served. Holiday Gift Certificates are available for purchase. Cash, check and credit taken. Learn the ancient exercise from China for increased wellness, including better balance, stronger muscles, and improved flexibility. Harvard Medical School Alternative Medicine Center claims Tai Chi decreased blood pressure and cholesterol, improves recover for heart disease and cancer patients, and helps people with Parkinson's disease maintain coordination. Come by on 11:30am this Tuesday, October 1st to FEEL the difference the exercise makes for yourself. Gift Certificates Available for Dads and Grads! 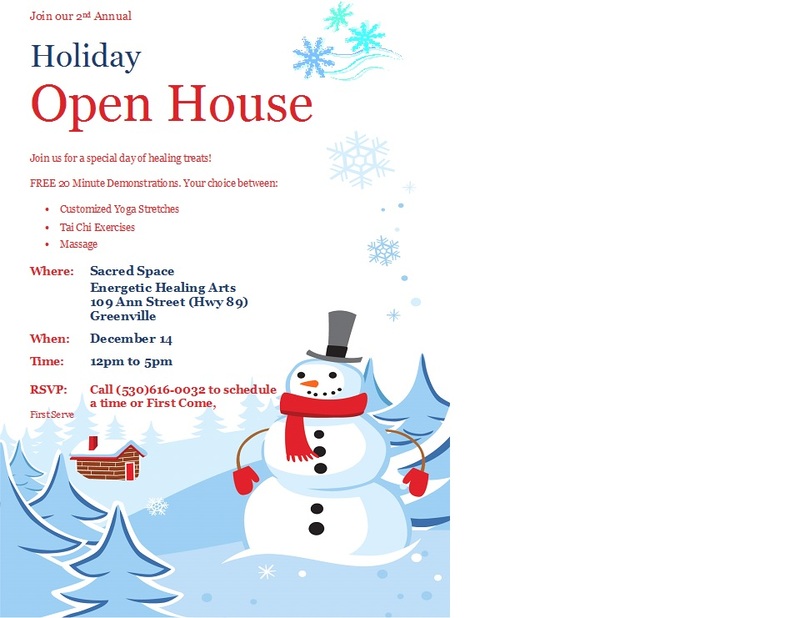 1 pm and 5 pm for some great Holiday Wellness Cheer! I will be offering FREE Demonstrations of all that I offer; Yoga, Massage & Tai Chi. Snacks and Goodies will be available. Gift Certificates will be available to take care of your Holiday Gift Giving needs. See you Saturday! Thanks to the Plumas County community, Sacred Space has been in business for two years! In honor of my clients and new clients to be, I am offering a 20% discount on single massage and specialty massage services. If you have been thinking about getting a massage, and the cost was holding you back, now is a great time to experience what massage therapy can do for you! Come in yourself or tell your friends. These past two years have been an amazing journey for me, getting to know the community and the community members. I can not express enough how grateful I am to everyone that has come in for a massage or a class, who has told their friends and family about my services, or has just stopped in to say hello. The support I have received from you has been amazing! I look forward to continuing to provide you with the best that I can give in order to help you improve your health, fitness, energy and to just help you feel good! Thank you, thank you, thank you! 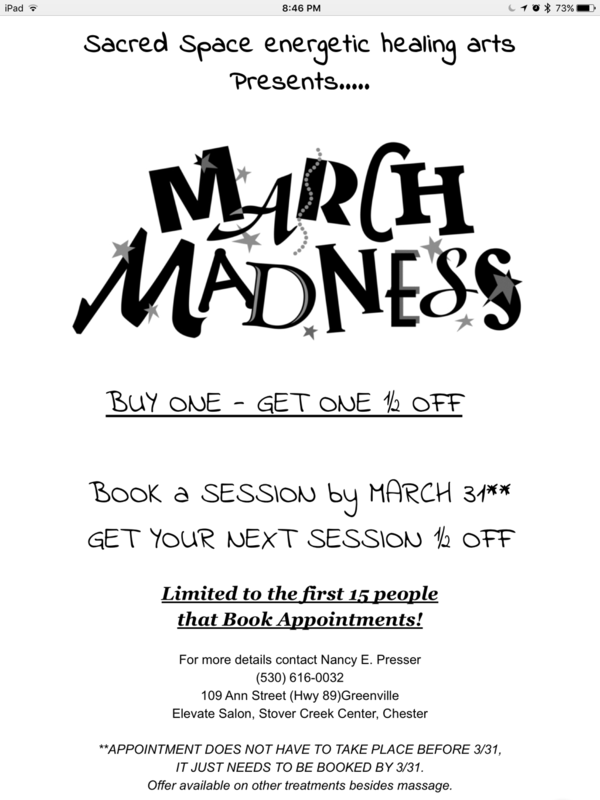 Come in and see me this month and let me know you are here for an Anniversary Special!!! NMTAW gives the community the opportunity to see, hear and feel how Massage Therapy can benefit them. Feel free to stop by my office for a FREE Massage Demo during business hours between my regular sessions and classes, or at one of the above locations. 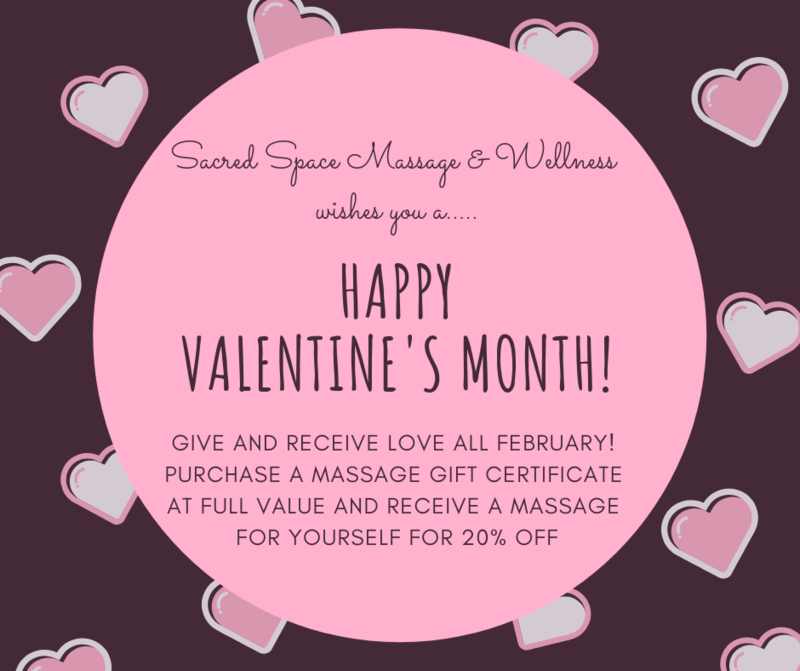 Participants of NMTAW will receive free information on the benefits of Massage Therapy, information about Sacred Space Energetic Healing Arts (SSEHA), and a 30% off coupon for a massage from (SSEHA). It is your body you live in. You only have one. So take care of it the best way you can. Massage will do that for you. Come by and feel what you will get out of a massage.